Case Kasbergen, Tulare, Calif., will receive one of seven Young Jersey Breeder Awards given by the American Jersey Cattle Association in ceremonies on June 22, 2017, during the association’s Annual Meetings in Gettysburg, Pennsylvania. The Young Jersey Breeder Award is presented to individuals or couples who are at least 28 years old and under the age of 40 on January 1 of the year nominated, who merit recognition for their expertise in dairy farming, breeding Jersey cattle, participation in programs of the American Jersey Cattle Association and National All-Jersey Inc., and leadership in Jersey and other dairy and agriculture organizations. Case Kasbergen has owned Registered Jerseys for six years, although he has been involved in the dairy industry his entire life. His father and mother, Cornell and Annette Kasbergen, raised Case on Rancho Teresita Dairy, which consisted of 500 milking Holsteins in San Jacinto, Calif., eventually relocating to Tulare in 1988. Throughout the years, Case has had multiple hands-on experiences that have helped in his growth and success within the dairy industry. A graduate of Cal Poly, in 2002 he moved to Mansfield, Ill., to help his uncle, George Kasbergen, start a dairy. Ultimately, Case moved back to Tulare and pursued sales within the dairy industry before he returned to the family farm in 2005. In 2009, due to the extremely high feed costs, the Kasbergens decided to introduce the Jersey breed to the herd because of feed conversion efficiency and to make better use of the 1,800 acres of farm ground. Case and his wife, Allison, then decided in 2012 to become partners in the family business. The Rancho Teresita herd today consists of 1,200 Holsteins and 2,400 Jerseys. At the end of 2016, the rolling herd average for the Jersey herd was 20,257 lbs. milk, 1,006 lbs. fat, and 774 lbs. protein on 2,361 cows. The herd is enrolled in the REAP and includes 158 Excellent cows and 1,554 more scored Very Good. 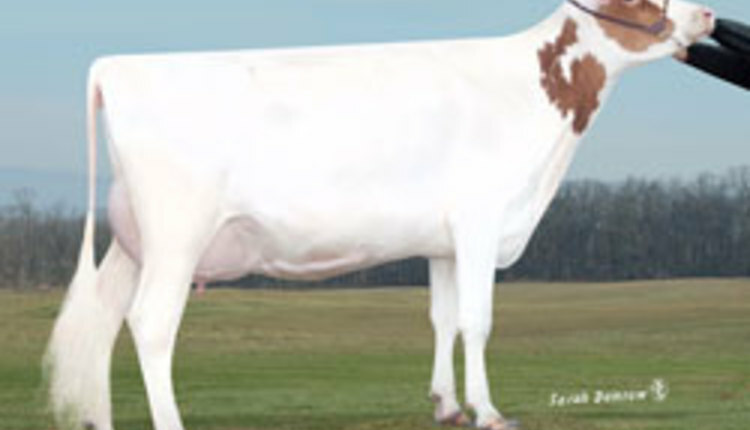 Currently, 27 heifers with the Kash-In prefix rank among the top 500 females for genomic Jersey Performance Index™. Fifteen more heifers rank on the top 100 polled list. The first Young Jersey Breeder Awards were presented in 1976. More than 280 producers have received this award, including the 2017 recipients: Bernie Bakker, Alvord, Iowa; Nathan Chittenden, Schodack Landing, N.Y.; J Hodge, Norwich, Ohio; Heather Hyman, Adams, N.Y.; Case Kasbergen, Tulare, Calif.; Clayton and Renée Kenny, Enon Valley, Penna., and Jessica and Cole Peters, Meadville, Penna. The American Jersey Cattle Association, organized in 1868, compiles and maintains animal identification and performance data on Jersey cattle and provides services that support genetic improvement and greater profitability through increasing the value of and demand for Registered Jersey™ cattle and genetics, and Jersey milk and milk products. For more information on the association’s complete line of services for dairy business owners, visit the website at www.USJersey.com or connect at Facebook.com/USJersey.